Mold remediation companies provide a number of services necessary to deal with the problematic growth of mold in the home - mold inspection, mold removal, repair of household damage due to mold. Some mold removal companies are certified in mold remediation, though certification is not required of mold remediation contractors so that’s something you want to inquire about when selecting a company to take care of your mold problem. Some people decide to just handle their mold problems on their own, and in some cases that might work out fine. However, the Environmental Protection Agency recommends not attempting to clean up a mold problem on your own if the mold covers more than ten square feet. The thing is, even though you may only notice a few square feet of bathroom tile affected by mold, mold spores spread easily through the air and mold can hide in many places, including your heating vents and air ducts. You probably won’t see it there yourself, but certified mold remediation contractors know how to track it down and take care of it. 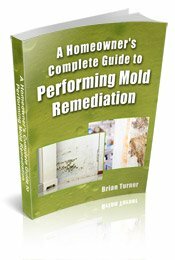 Something else to consider is that there are different types of mold, and different techniques are used to thoroughly remove different types. If mold is not thoroughly removed, it will continue to grow and spread, putting you and your family at risk for all sorts of health problems. 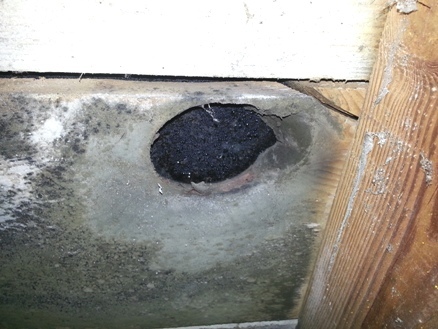 The picture below shows a bad case of black mold in an attic. Attic mold removal is usually a difficult job because it is hard to remove mold from porous surfaces like wood, and sheetrock and insulation usually need to be replaced. Unless you live in a very small town, you probably have several mold remediation companies from which to choose. Don’t just settle for the one with the biggest ad in your local yellow pages. You can call your local Department of Health for suggestions, or check with the Better Business Bureau. The important thing is to make sure you choose a company that will do the job right. Some companies that handle mold remediation employ professional engineers, and while mold remediation contractors don’t have to be engineers in order to know how to take care of mold, a company with such high standards may be a good choice. Some companies employ only certified mold remediation contractors, which tells you the contractors at least meet minimum standards. Ask questions before deciding which mold remediation company is right for you. Find out exactly what services they will provide, what qualifications the services providers have and what it will all cost. Most mold remediation companies offer a free inspection and assessment, during which they will examine your home for mold, tell you about the extent of your mold problem, advise you about the best way to resolve your mold problem and let you know what they will charge to handle the problem for you. Request that a certified mold remediation specialist perform the inspection. You can consult with more than one company if you like before deciding which one to hire. A certified mold remediation specialist can test the mold in your home to determine which type of mold it is, because that helps determine the best way to treat the mold. However, we recommend that you hire a separate mold testing specialist so than an independent professional is overseeing the removal process. He will check for hidden mold, develop a removal plan, and make sure all affected areas are treated properly. You can follow this link to get a list of Mold Testing Specialists in your area. The mold remediation company will also make sure to follow proper safety precautions so that mold is not spread to any other areas of your home. This includes closing off any areas where he is working so that mold spores don’t go airborne and drift to other areas of the house and securely enclosing any contaminated materials in protective coverings before carrying them through the house for disposal. Of course, he will have all the necessary safety and protective gear. You have health problems that might be exacerbated by contact with mold spores, such as asthma or other respiratory disorders. There is a musty odor in an area of your home but you cannot find any mold in the area (a musty odor almost always indicates mold growth, but often the mold is growing inside walls, under floorboards, inside heating ducts, or in other hard-to-locate places). You have mold growing in your heating ducts. You have mold growing on wooden support beams inside your walls. Mold has grown after flooding with contaminated water, such as water that might contain sewage or other hazards. To schedule a free consultation with a mold remediation professional, follow the link. New insulation being installed after mold was removed.